Last year, natural gas combined-cycle plants averaged a capacity factor of 56.3%, compared to 54.6% for coal steam power plants. Natural gas power plants depend on a variety of technologies, including steam turbines and combustion turbines. Coal power plants, on the other hand, are fueled by steam-driven generating units. As their name implies, combined-cycle plants can be seen as an efficient hybrid of these two technologies. Since the decline of natural gas prices, power plant operators have been running combined-cycle plants at higher levels. For example, natural gas combined-cycle plants ran at a capacity factor of only 35% in 2005, compared to 56% last year, which represents a 60% increase. Another factor that may affect electricity prices is the Mercury and Air Toxics Standards (MATS), which aims to limit the emission of mercury and other air toxics by reducing the use of coal power plants. The law went into effect in April of 2015; however some plant operators are still operational and functioning on an extension plan. Eventually, these plants will need to change fuel sources, cease operation or integrate approved pollution controls to adhere with the new standards. 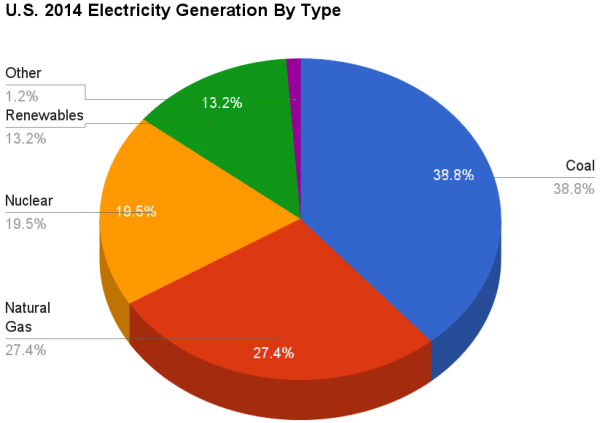 Taking into account all of the above, the United States Energy Information Administration (EIA) predicts a 7.1% reduction of coal generation in 2016, which will be offset by a 3.4% increase in the generation of natural gas. Based on a combination of factors– such as lower natural gas costs, slower growth for electricity demand, and bureaucratic policies that encourage the use of renewables, the type and quantity of generating capacity being added annually is changing. On average, the U.S. has been adding 18.3 gigawatts of additional generating capacity annually since 1950. Projections for 2016 include a total electricity generation in the United States to be around 11.1 terawatt-hours per day. In the above estimate, one terawatt hour is equivalent to 1012 watt-hours, where one watt-hour (Wh) is equivalent to 1 watt of power outputted in one hour of time. Projections for 2017 include a 1.6% increase of power consumption. This summer, temperatures in the United States are projected to be lower than in 2015 with an estimated general 5% decrease. States in the South Atlantic, specifically, will have temperatures 10% lower than last year, a decline that will lower summer residential electricity bills by 5%. In contrast, temperatures in the North East central states are forecasted as 12% higher than 2015, which translates, according to the EIA, as an average residential bill increase of 8%. Electricity prices in the U.S. are currently measured at 12.6 cents per kilowatt-hour (kWh), a slight decrease from 2015 (12.6 cents per kWh). Estimates from the EIA also include an increase to 12.9 cents per kWh in 2017. In order to help the population decrease their monthly power bills, some utilities have begun the implementation of programs that promote the use of electricity during off-peak hours by offering rebates or reduced electricity rates. Through the use of home energy management systems and smart meters, users have the ability to decide how or when their households utilize electricity. For instance, running a load of laundry at nighttime, considered to belong to off-peak hours, would cost customers less than if they were to run their washing machines or dryers in early evening hours. Since electric vehicles and plug-in hybrids usually recharge at night, time-based electricity programs could significantly help cut down the electricity costs of hybrid vehicle owners. Solar: solution to rising electricity prices? Utilities aren’t adequately accounting for the benefits that solar brings to the grid, including an energy source that decreases demand during peak use, reduces transmission and distribution costs, increases consumer choice, lowers greenhouse gas emissions and contributes to cleaner air. As for the homeowners, when they begin to generate their own solar power, electricity bills can drop significantly. Photo Credit: Daniel Cardenas via Wikimedia .